"Cry, Baby" at The Andy Warhol Museum marks the first museum solo exhibition by Devan Shimoyama. Home > "Cry, Baby" at The Andy Warhol Museum marks the first museum solo exhibition by Devan Shimoyama. 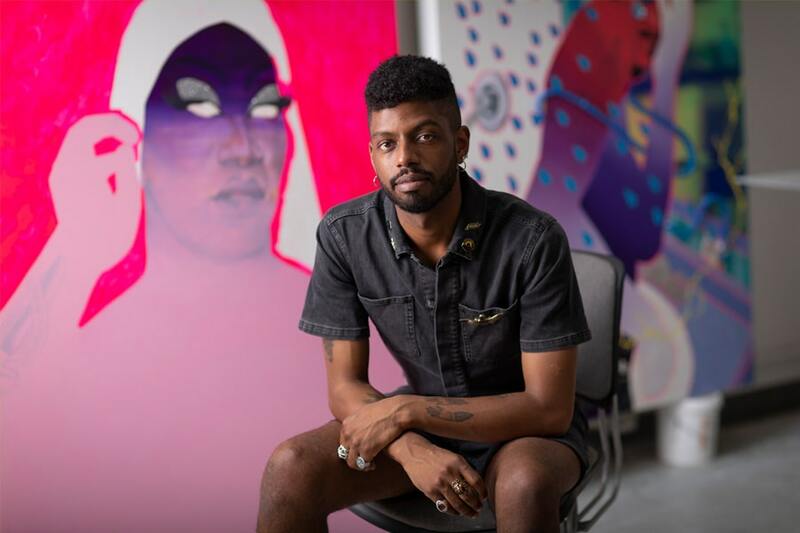 "Cry, Baby" at The Andy Warhol Museum marks the first museum solo exhibition by Devan Shimoyama, the Cooper-Siegel Assistant Professor in the School of Art. Shimoyama's bright and bold canvases — incorporating unconventional materials like glitter, rhinestones and fabric — challenge cliché with daring and personal representations of race and sexuality. Teaching at CMU, said Shimoyama has "really opened up my practice in a way where I feel more comfortable reaching into my inclinations and allowing myself to do something that feels outside of what I've learned or am allowed to do in my own work." As part of the Warhol exhibition, his barbershop series reimagines a hyper-masculine social space as a glittery queer fantasy. Celebrated for fraternity and community, Shimoyama presents the barbershop as a space where young men and boys can feel shamed and vulnerable. Another series on display, currently unnamed, celebrates drag queens in large-scale heroic portraits. "Cry, Baby" also includes Shimoyama's sculptural work, created as objects of mourning for Trayvon Martin and Tamir Rice, both examples of the aggressive targeting of African-American youth as fearful or threatening. "What Devan is doing now is creating a space to embrace alternative perspectives on race," said Jessica Beck, the Milton Fine Curator of Art at The Warhol, visiting scholar at CMU's School of Art and curator of Shimoyama's show. Beck said Shimoyama is "queering the identity of race, bringing in the feminine and not positioning masculine always around blackness." "Cry, Baby" will be on view at The Andy Warhol Museum of Art Oct. 13 through March 17, 2019, with several events throughout the run of the exhibition. In 2019, Holland Cotter selected Shimoyama as one of the The New York Times' 19 Artists to Watch, His work has been written about in The Los Angeles Times, NBC News, New American Paintings, and Artnet News. In 2016, Shimoyama was named the winner of the Miami Beach PULSE Prize at PULSE Miami Beach.